This is a Japanese Maple drawn during lunch breaks and after work the past few weeks. It’s a managable 12 x 12 inches but still, this was a slow and clumsy endeavor. I’ve always wanted to be that artist who makes fantastic drawing look easy, but I fall into the practice and perseverance camp, even after so many years. Tree shapes are wildly complex and detailed, and you almost instantly feel lost trying to map them in space. 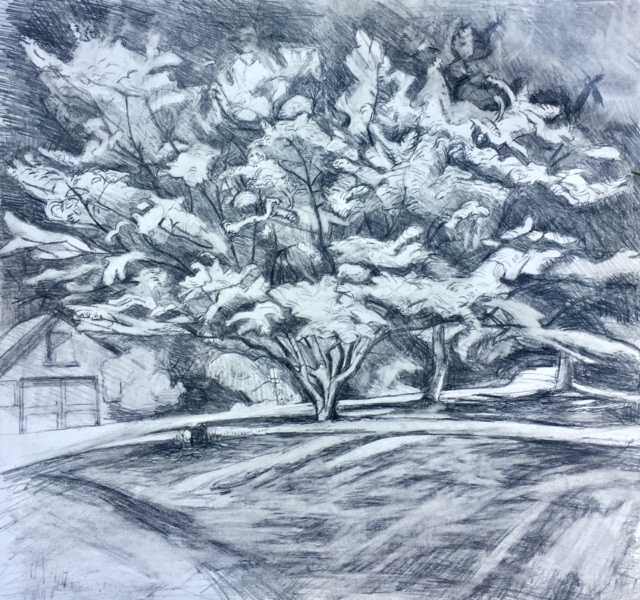 Plein air artists have a technical toolbox of resources, ways to break down the living landscape and then translate that to pencil and paper. These tools include measuring scale and proportion, shade, form, distance and texture; and these skills are juggled as the artist muddles through. Ideally, the drawn line can simultaneously convey a specific contour, the shade from light to dark, its form, and scale. But it's just so hard to do that when drawing a tree! The detail is immeasurable, like stars in the sky, and changes with the wind and light. So, you erase and redo, and, over time, it sorts itself out. In that process, you’ve gotten to know the tree like an ant across a lawn, and a memory develops for its peculiarities. That's why a drawing is usually a study for a painting, because the act of drawing gives you enough familiarity and grit to later create a studio painting with merit. Below are some of my favorite trees by artists who have influenced me. Graham was my primary teacher at the New York Studio School and he basically formed me as a painter. I will always be grateful to him. Stanley Lewis, “Hemlock Trees Seen from Upstairs Window in the Snow” (2007-2014), pencil on print paper, 68 3/4 x 59 3/4"
Stanley was my first landscape teacher. Here's a great little video I found which is very much what it was like to learn from him, and is, basically, how I think as a painter.